Continuing our series on the election battles across the Black Country and Staffordshire, today we look at Halesowen and Rowley Regis. Halesowen and Rowley Regis is another Black Country seat that has backed the biggest party in the last five elections. It returned Labour MPs during the Blair years and Conservatives MPs during the two elections under Cameron. The seat was created in 1997 after the merger of parts of the former Halesowen and Stourbridge constituency and the former Warley West seat. 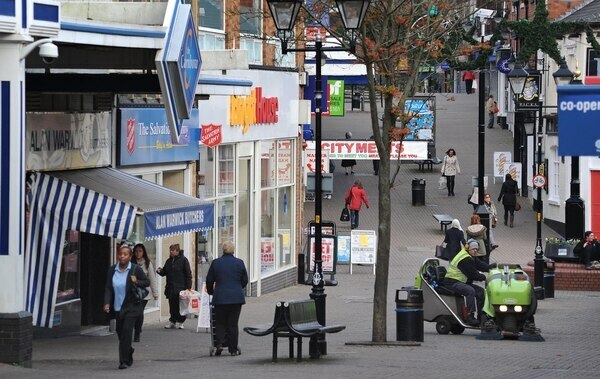 It covers parts of Dudley and Sandwell boroughs, including the towns of Halesowen, Cradley Heath, Blackheath, and Rowley Regis. It has a mixture of traditional Tory and Labour voters, meaning that it is viewed as a marginal constituency. Unemployment has reduced in recent years but austerity has meant public services have faced cuts. From 1997 until she stood down before the 2010 general election, Sylvia Heal was the Labour MP here. On becoming the MP for Halesowen and Rowley Regis, she gained more than half of the votes in 1997 and 2001. James Morris, who first won the seat for the Tories in 2010, is again defending his seat after retaining it with an increased majority in 2015, winning 43.2 per cent. The gap between him and Labour is currently 3,082. According to latest figures, 2.7 per cent of people are on out-of-work benefits – which is slightly higher than the national and regional average. A quarter of people are educated to degree level or above – again below the averages. And the average weekly pay is £492.50 – while the average across the West Midlands is £507.80. 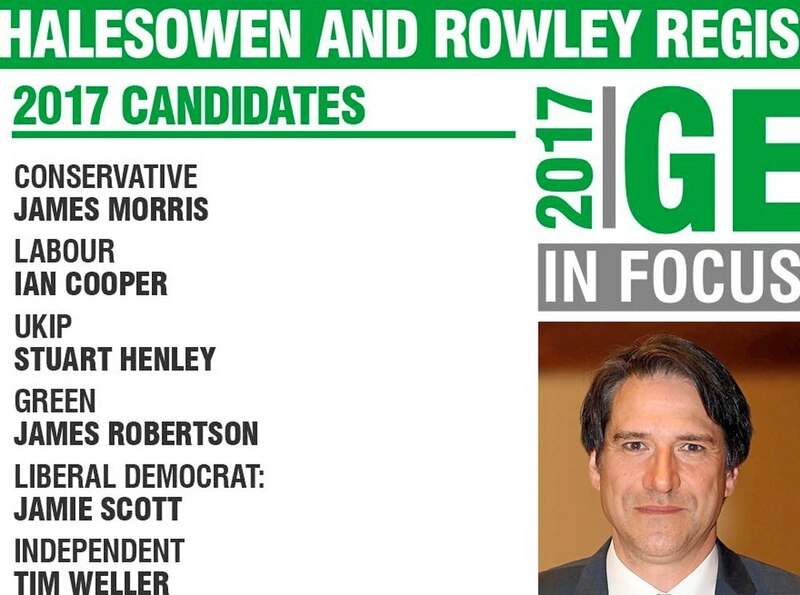 Who are the 2017 election candidates for Halesowen and Rowley Regis? James Morris is hoping to keep the seat Conservative. Labour’s challenger from two years ago Stephanie Peacock is this time contesting the safe seat of Barnsley East. In her place is Dudley councillor Ian Cooper who was in charge of children’s services until Labour was ousted out of control last month. He works for Sandwell Council as a public health alcohol awareness officer. 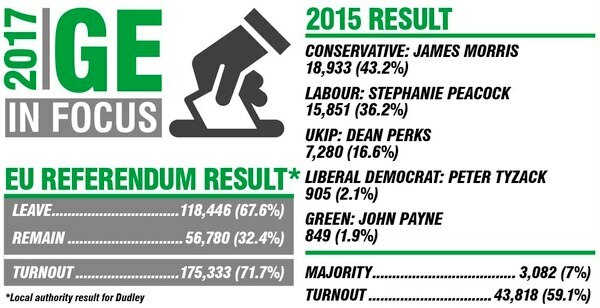 UKIP came third in 2015 when Dean Perks won 16.6 per cent of the vote. The party’s candidate this time is Stuart Henley – a councillor on Dudley Council who is also a West Midlands firefighter. The Liberal Democrats polled a poor 2.1 per cent two years ago. The party’s candidate, Jamie Scott, will be hoping to win more votes this time round. James Robertson is running for the Green Party. Tim Weller, who lives in Halesowen, is running as an independent. He is is well-known local environmental campaigner. James Morris performed well in the constituency to increase his majority here two years ago amid a mini Labour revival across the Black Country. Swing voters with no firm party allegiance hold the power here as the constituency is dominated by loyal supporters on both side of the political divide. Given they rejected Ed Miliband’s brand of left-wing politics in 2015, it is hard to see them backing Jeremy Corbyn this time around. The Tories have paid a lot of attention to this seat since winning it in 2010. George Osborne was a regular visitor and Mr Morris is well liked by the Tory leadership. However many constituents will still be feeling that times are tough with their weekly wages below the regional and national average and relatively low education rates. The bookies have Mr Morris as a strong favourite but Labour and UKIP have very strong local candidates who undoubtedly would be popular and work hard on behalf of people in the constituency. Things have been going to Tories way here recently with Andy Street getting a lot of support in the seat which led to him being the first elected mayor for the West Midlands plus the Tories taking control of Dudley control. Even with the gap in the polls narrowing, it appears there is too much work for Labour to do here to overturn what is a slim majority. It won’t be a landslide for Mr Morris. – it will be a close race but he should be confident of increasing his majority once again.